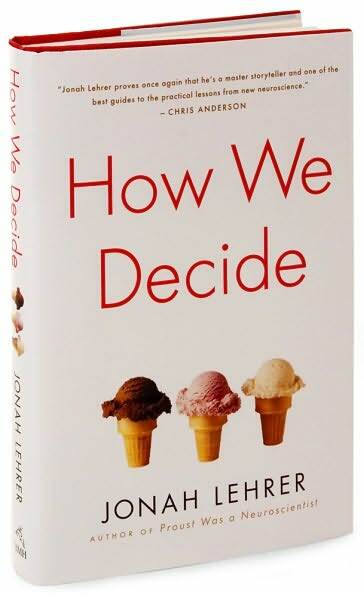 My latest work reading, completed just this week, was Jonah Lehrer’s How We Decide, an engaging and easy-to-read account of the brain science (as we currently understand it) behind our decisions. Drawing on ancient philosophy, modern psychology and neuroscience, and examples as diverse as military conflict, professional sports, gambling, and shopping, Lehrer exposes the strengths and weaknesses of our emotional and rational thought processes — and shows each to be inadequate without the other. The book was a relatively quick read, understandable and action-packed, which is not always easy to achieve when writing about science. The stories used to illustrate key strengths or weaknesses of the ways in which we think are sometimes suspenseful, sometimes tragic, and always fascinating, and several times I saw myself in the concepts illustrated by the book: recognizing what I would do in a situation before I know why; looking for patterns where there are none; over-thinking in some cases, and making snap decisions in others that prove to be simply (and obviously) wrong. Even so, this chapter and the entire book are compelling, thought-provoking, and even entertaining at times — read it if you have a minute.